20 October/November 2018 unmanned systems inside USER SHOWCASE FIELD TESTED, FIELD PROVEN. The FL AR M module makes the drone visible to manned aircraft f lying in the area, Reitz said. "It's a small transmitter that senses the position of the drone every second and has a range of 20 kilometers," he said. "Every helicopter, for example, can receive the sig- nal, which is also around the drone. If the other aircraft are equipped with the FLARM module, the cockpit will generate a warning, so every manned aircraft is warned when they approach the drone. And our drone can detect if airplanes approach the airspace around it." Another benefit of the system? It features direct geo-ref- erencing, so there's no need for ground control points, Flick said. The technology needed to reference the hundreds of pictures captured is already in the drone, saving the time it takes to put out and collect ground control points and making it pos- sible to produce the high-quality mapping products companies like Strabag require. "We use a four-point check for quality as- sessment," Flick said. "This is very important because otherwise we'd have to put out doz- ens of ground control points, say 100, to get the accurate point cloud. With the mapper's IMU onboard, the metric camera, sensor and double frequency GNSS antenna, we're able to get this type of data in BVLOS flights." 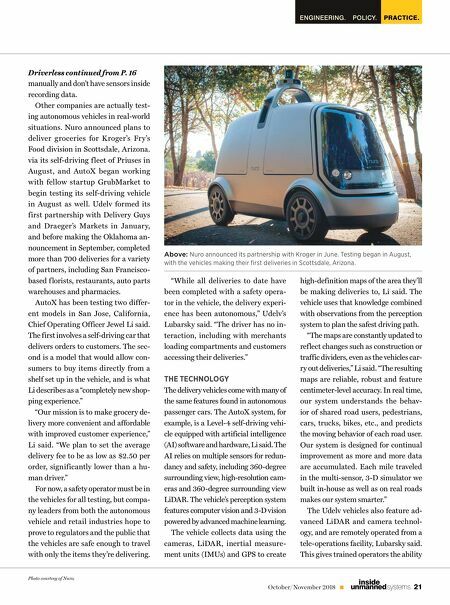 Conventional Mapping Traditionally, when companies need to complete a large corridor mapping project, an employee uses a GPS rover to collect the hundreds of points needed to create the map, Flick said. This could takes days or even weeks to complete. The mdMapper1000DG, on the other hand, finished both corridor f lights for Strabag in about half an hour each. It's a lso ea sier to continua lly map a n a rea that changes over time when using a system like the md- Mapper1000DG, Flick sa id. R ather tha n send ing someone out multiple times to collect data to moni- tor progress, the drone can complete the mission in a day. "With this drone you get a lot more data very fast and it's a lot more detailed than what you get with conven- tional mapping," Flick said. "And you can process it the way you want to process it. If you want to look at just half of the data collected and process it that way you can." Moving Forward The system performed even better than expected during this project, Flick said, and has opened the door for other BVLOS drone f lights in a variety of industries, which is huge for UAS manufacturers and operators. "What we came out with is a real-world scenario for f lying BVLOS in uncontrolled airspace. This works right now," he said. "We have a commercially viable BVLOS solution in Germany. This really is a milestone in the industry." We have a commercially viable BVLOS solution in Germany. This really is a milestone in the industry." 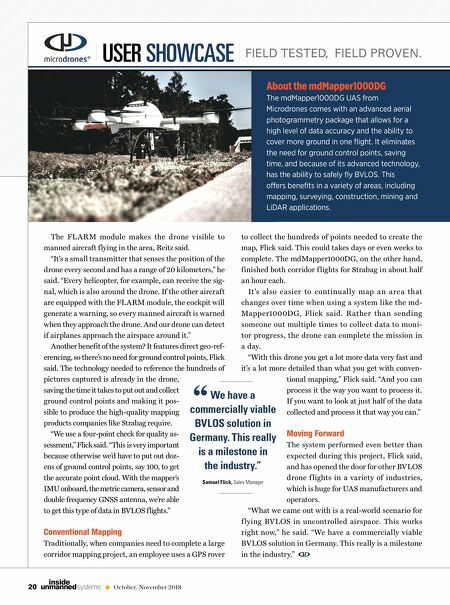 Samuel Flick, Sales Manager " About the mdMapper1000DG The mdMapper1000DG UAS from Microdrones comes with an advanced aerial photogrammetry package that allows for a high level of data accuracy and the ability to cover more ground in one flight. It eliminates the need for ground control points, saving time, and because of its advanced technology, has the ability to safely fly BVLOS. This o‚ers benefits in a variety of areas, including mapping, surveying, construction, mining and LiDAR applications.